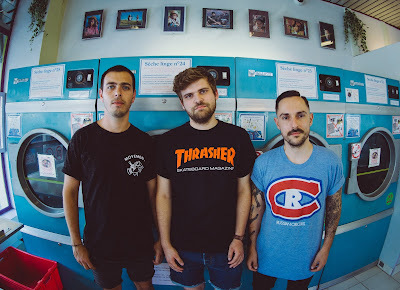 French punk trio SOUTH BERKELEY have recently unveiled their first single called 'Tiny Rascals', check out the new song and video below! "Tiny Rascals" is part of the calmest songs of the album. It's a haunting ballad with a fast groovy beat. The aim of this song was to bring back that sad and melancolic catchiness that tints some emo punk rock songs of the early 2000's. We like to describe some naive and pointless components in our lyrics, in a way to plunge the listener, either into a realistic context or into a dreamlike world. The spine-chill to your motion picture film"
The band stated: "That verse described in a metaphoric way, how disturbing and heartbreaking the passage through childhood towards adolescence can be. That feeling of being on edge, of being excluded and rejected by a pack of popular and superficial kids that enjoy to be rude."